Johann Ramberg was the son of the architect Johann Daniel Ramberg (1732-1820). He was educated by his father in drawing and supported by King Georg III he studied in London from 1781 to 1788. In 1789 he designed the famous curtain for the Hoftheater in Hannover that was destroyed in 1943 during the war. From 1790 to 1793 he was in Italy and after his return in Hannover he was appointed court painter. He married in 1797. He illustrated almanacs and pocket books for over twenty years. Ramberg is the illustrator of a deluxe edition of the works of Wieland and he also illustrated work by Goethe, whom he had first met around 1790. 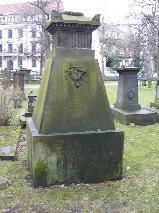 The grave of Johann Heinrich Ramberg at the Ehemaliger Gartenfriedhof, Hanover.